The Mackinac Bridge, lovingly called “Mighty Mac” by Michiganders, spans the five miles across the Straits of Mackinac where Lake Huron and Lake Michigan meet at the tip of the mitten. A bridge had been on the minds of many since the 1880s and in 1888 was proposed by Cornelius Vanderbilt II during a meeting of the board of directors of the Grand Hotel on Mackinac Island. But it took until 1954, in part because the Korean War made resources scarce, to finally begin construction. The Mackinac Bridge opened to traffic on November 1, 1957 and celebrated its 150 millionth crossing on September 5, 2009. Today it’s the longest suspension bridge in the western hemisphere (and third longest in the world), and the Mighty Mac remains one of Michigan’s greatest engineering achievements; you only have to ride over it once to appreciate the wonder. Although tours aren’t available, you can look forward to crossing the bridge on your way into and out of the Upper Peninsula. You can also view the bridge cam 24/7 on the Mackinac Bridge Authority’s website. From St. Ignace on the north side of the Mackinaw Bridge, travel north to Sault Ste. Marie to visit the amazing Soo Locks, one of the greatest feats of maritime engineering anywhere on Earth. The oldest of the locks, the State Locks, were built in 1855 to enable fur traders, Native Americans, and explorers to get to and from Lake Superior and Lake Huron without portaging the dangerous falls that dropped 21 feet from the former to the latter. The construction of the Soo Locks was spurred by the discovery of copper and iron ore in the Lake Superior Basin. Over the next several decades the Poe (1896), Davis (1914), Sabin (1919), and MacArthur (1943) locks were constructed. Today, the locks remain 100 percent gravity fed. The Poe Lock alone requires 22 million gallons of water to lift or lower a freighter, the longest of which is over 1,000 feet. The Soo Locks are just one of many amazing sights to see around Sault Ste. Marie so you’ll want this stop on your itinerary. Next, head west toward the Keweenaw Peninsula for two breathtaking engineering marvels pretty close together. In Hancock, the Quincy Mine represents the rich and rugged history of our state’s mining past and incorporates some mechanical monsters you won’t see anywhere else like the “Nordberg Steam Hoist, the largest steam-powered hoist engine ever built.” Although the mine ceased operations in 1945, the property operates as a not-for-profit and a cooperating site of the Keweenaw National Historic Park and provides guided tours in the form of tram rides and rides inside the mine on the Quincy Electric Reversible Mine Transport (QERMiT). From there it’s a short ride to Houghton over the Portage Lake Lift Bridge (aka the Houghton-Hancock Bridge), still the only double-deck, vertical lift bridge in the state. Completed in 1959 and dedicated in 1960, the bridge had both automobile and train levels (although trains no longer cross it) and rose to allow ships to pass beneath as needed. At the time it was the heaviest lift bridge ever constructed. In fitting U.P. fashion, the lower level is now used by snowmobilers and skiers to cross the channel during the winter months. Round out your tour by heading southwest to Ironwood, home to Copper Peak, the only ski flying hill outside of Europe and the smallest such facility approved by the International Ski Federation. Built in 1970, the slide, affectionately known as Suicide Hill, towers 241 feet above the summit of Copper Peak, putting it 1,782 feet above sea level (and 1,180 feet above Lake Superior). Needless to say, that great height allows for fantastic viewing, which on a clear day can include Isle Royale and the Porcupine Mountains. 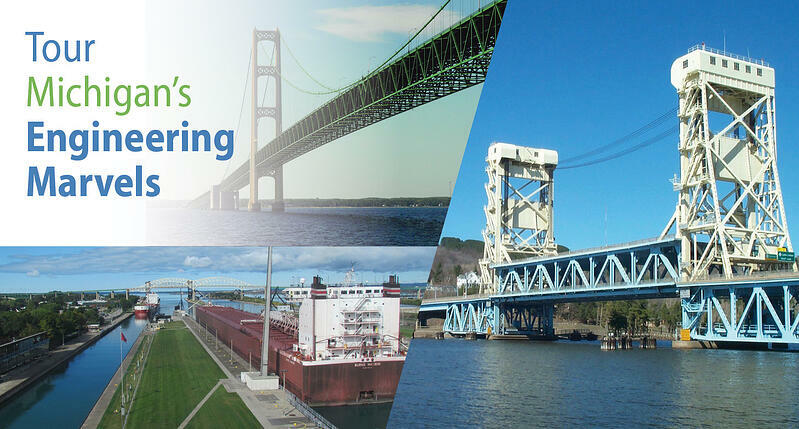 Michigan’s Upper Peninsula is a beautifully rugged place that required extremely durable and innovative people to make it livable and prosperous. Don’t miss a chance to experience some of this innovation at its best and book your Indian Trails charter today for a tour to remember.